By Namekojirushi and Nao Watanuki. Released in Japan as “Ore ga Heroine o Tasukesugite Sekai ga Little Mokushiroku! ?” by Hobby Japan. Released in North America digitally by J-Novel Club. Translated by Mana Z. What struck me most about this volume of Little Apocalypse was what a well oiled machine Rekka’s heroine saving has become. We get three heroines arriving one right after the other, and Rekka and company know what’s going to be happening – he’s got to save them all. He picks out his crack team of Rekka’s Angels based on who he feels would fit best with what’s planned, and for the most part he’s absolutely right about it. The girls occasionally fight over him, but it’s “offscreen” so we don’t actually need to see it, and when times get tough they’re all business. They’re also the main “muscle” of the story – Rekka admits point blank that he’s the sort of person to rely on the powers of others, and they certainly have a lot of power. That said, there are certainly some spanners in the works in this volume, both on the heroine end and the plot end. Our heroines this time include Haruka Tenou… erm, I mean a phantom thief who has unfortunately put a cursed tiara on her head; Setsuna Sakurazaki… erm, I mean a noble samurai girl from 500 years in the past trying to save her princess; and another princess, this time from Atlantis, 1000 years in the past. As you can imagine, there’s going to be some time travel here, but by now everyone mostly shrugs it off. The phantom thief is the easy part of Rekka’s mission (and honestly the dullest – she’s too perfect). The samurai is more of an issue, as Rekka, due to events, chooses to prioritize the other two girls first, which pisses her off, especially as she hasn’t yet seem Rekka in action and doesn’t trust him. Why would you trust a guy with a harem of girls who says he can fix everything? Moreover, the Atlantean princess, who as a tragic ghost was noble and sweet, as a living being is… well, a spoiled princess. The other spanner here is the plot twist near the end, which I thought was rather clever. You know that things are going badly when R can actually talk to Rekka about his actions – usually she can’t influence him. It also allows Rekka to save the day at the end with a very clever device that relies on his “greed” – not for money or power, but his desire to save all the heroines (who are listed in order, which is helpful as I’ve forgotten some of them). I was also amused, if somewhat ruefully, at the twist at the end. Rekka thinks that, due to the fact that two of his three heroines this book live in the past, that he’s not going to have them joining the cast herd. Nope – here they are, and the explanation actually works. This is what you have to face up to when you’re a man whose inability to get it romantically led to the end of the world. So a strong volume in the series, and we’ve only four more to go. How many more heroines can we stack on? And will Rekka manage to graduate? By the end of this volume, we have five left to go before the series ends. It’s started to make me wonder what the endgame is actually going to be. Oh, I’m still convinced it will end with him not choosing anyone. But it has to be said, if he is going to choose one of the girls, it has to be someone the reader has a strong attachment to as well. And, well, First Girl Wins is not just a trope for nothing. Satsuki has an advantage that the other girls do not. She’s a childhood friend, she has magical wikipedia powers and is therefore involved in Rekka’s life rather than being kept in the dark. And she gets a big focus in this volume as well, as she and Rekka are accidentally sent to a deserted island for a while, where they can wax nostalgic, almost get eaten by a leopard, and come close (but not close enough) to a confession. Satsuki is not on the cover, of course. The interesting thing, though, is that both girls on the cover, while heroines that Rekka “solves”, are not romantic heroines that we can see. Yulia is a nun who, like many Japanese nuns in fiction, is also an exorcist and a bit of a fanatic. Given she’s ended up in Rekka’s hometown, which is teeming with otherworldly inhabitants, particularly the vampire Rosalind, you can see why Yulia is flipping out a bit. In fact, dialing back her fanaticism is the point – she’s mistaking the Church’s vendetta for her own, and Rekka has an actual Angel to tell her “no, God says the Church is wrong”. (A very common thing in light novels lately.) As for Poppy the fairy, “staying hidden” and avoiding a group of kids trying to capture her is the sole goal she has. Compared to prior volumes, the stakes are very low key here. Back to Satsuki, a surprise in this volume was that we not only see her parents, but get art showing what they look like. (In fact, the author wondered if there were enough interesting scenes for the artist, which may be why we see her parents as well as the kids harassing the fairy.) The other plot-heavy part of the book involves L, who has been abandoned by her villain friends and is on her own in the past, and essentially homeless till she gets picked up and adopted, for the moment, by Satsuki’s family. She’s still trying to kill Rekka technically, but it is interesting that whereas R is going for “hammer Rekka with as many heroines as possible to create a crisis point”, L is more “I am in one heroine’s corner”. And that heroine is Satsuki. Will she win? Likely we won’t know till Book 16. Will R ever be seen? And of course the one question that absolutely has to wait for the last book: will Rekka get a clue that everyone is in love with him and do something about it other than change the subject? We do apparently get a girl in a top hat, though, so that’s nice. If you’ve been reading this, keep reading it. It’s fun froth. More volumes, more girls. And perhaps a sneak peek at the bad future that R keeps talking about. No, we’re not actually seeing said future – since the author is nothing if not predictable, I suspect that we’ll get that in Books 15 or 16, the final ones – but thanks to a ditzy and morally questionable angel, we do get a sneak preview of what the war of Rekka’s fiancees would be like. It’s not a pretty sight. Rekka’s girls have never been as tight-knit a group as, say, Rokujouma, but jealous glaring is all we’ve previously been a party to. Unfortunately, the girls he’s saved who are in love with him also happen to possess insane amounts of power, power which could easily be destructive in nature. And so when the limiters are taken off… well, thank goodness it’s limited to property damage this time. As for Rekka? Still acting clueless, though even he is finding that front hard to keep up with Iris in full throttle mode. 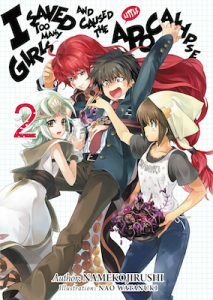 The girls in this book are: the aforementioned Angel, who needs “love energy” to survive, though “jealousy” might be more accurate, and too much of it leads to the plot; an intergalactic producer trying to have another big hit by producing a sentai show, which sounds like a good idea till Rekka falls on her lead actor and puts his back out; and a magical girl dedicated to love and justice, not in that order (at least not at first), who is somewhat started to find herself in the wrong genre when a kaiju starts to wreak havoc. Unlike the last big and dramatic arc, this one is fairly easy to resolve – indeed, the book’s very much on the short side, so one might say it’s a bit too easy to resolve. Since Little Apocalypse runs on cliches, it’s good to see they’re all present and correct here, as the magical girl, now in a sentai/kaiju story, powers up by others believing in her, a la “clap for Tinkerbell”. Unsurprisingly, Rekka believing in her has far greater an effect. How much you enjoy this book might depend on how much you enjoy harem antics at their most obvious. This takes place on the first day of school, but we don’t even make it there, as Iris (helped along by the love angel) decides to take Rekka on a date to an interstellar amusement park. Iris hasn’t gotten as much to do lately, so this gives her some good face time, and as one of the most “forward” of the heroines she comes very close to actually, if not scoring with him, at least making him acknowledge her love. But it’s Vol. 10, not Vol. 16, so instead we get half a volumes of girls attacking each other (and Rekka). R spends much of the volume frustrated, and you can see why. We have six books to go till the end, and I think even the author knows he can’t string this along forever. But he’s strung it along enough. This is a decent Little Apocalypse, with two of the three heroines being pretty likeable. I also enjoyed the theater references. Sides! Eventually this series is simply going to have to run out of stereotypical heroines to stack on to Rekka’s pile. We’re down to two – well, one, really, but I have my suspicions about the other – in this book, and the cracks are starting to show – I’m OK with beloved childhood friend, but beloved childhood PET? Yes, turns out the cat was a cat yokai of some sort, and now She Is All Grown Up and everything. Of course, she still acts like a cat. Her story is probably the weakest in the book, actually, as this is essentially a book of four short stories with a wraparound, and so it gets resolved quickly and easily. Possibly realizing that, the author gives us a little more depth to both heroines from the 6th book, who R wasn’t quite sure were heroines or not last time. They may not have crises to resolve, but they do both seem to like Rekka. And then there’s R.
I have been crying out for more character depth and insight into R and her future, and it looks like I’m finally starting to get it. The other “girl” in this volume is an assassin from the future, and the moment we hear she’s named L we know she’s connected to R in some way. As it turns out, she’s the prototype for what R is, and it was originally her mission to save the world… but things took too long, and R had better specs, so she was used instead, and L was sent to live her own life and, well, get corrupted by the forces of evil. As frequently happens in this sort of story. I’m not entirely certain if we’re going to add L to the harem list, but the door is open for her return. That said, I found R more fascinating here. For the most part she remains her dry, emotionless snarky self, but dealing with L finally forces some actual anger and rage out of her, mostly because she can’t be like Rekka. Much as this series tries to have Rekka be a parody of the clueless harem guy, and he absolutely is, when it comes to saving the girl he’s really, really good at it. R has watched him save the day time and again against all odds, and it’s very frustrating to R that she is ultimately unable to talk any sense into L or save her. Unfortunately, the drawback of my enjoying her plotline is that the rest of the book feels off-balance, as if the other three stories aren’t up to the task of the final one. There’s nothing wrong with them – everyone goes to the pool and tries to flirt with Rekka, to no avail; they hold a “summer camp” at the school in an effort to give Midori a bit more depth, which… works a bit, but she still suffers from not really having had much impact in her debut. So in the end this volume of Little Apocalypse is just OK, but the best part is at the end, so it will leave you happy when you finish it. We conclude Little Apocalypse’s first two-parter here, and though things end as one might have expected, the purpose of the journey has changed. Little Apocalypse has always waffled back and forth between whether it’s a parody or not, and it’s true that the next volume may make me eat my words, but for the moment it’s taking itself seriously. What we see here is what we’ve seen in previous books. Rekka uses various powers that he has available to him via the girls around him to solve his problem. (It’s much like Rokujouma in that regard.) But there’s little joking around here, the villains are seen to inflict horrible consequences, and the solution, as R notes, may actually make things worse. In fact, that’s how you know things are super serious – R is actually dispensing advice and trying to help, at least as much as she’s allowed to. Speaking of R, we get to hear more about her actual mission than we have since the first volume. It’s clear that she’s not allowed to help Rekka figure out which girl he likes, or even clue him in that the girls like him. She’s only allowed to help him in his missions to save the girls’ stories. As we’ve seen, this can be very frustrating to her, as Rekka is deeply clueless about the feelings that the others have for him. That may change soon, though I somehow doubt it – he seems to think that Harissa’s gambit at the end of the book here might be accidental, whereas I’m pretty sure she, and R, knows exactly what she’s doing. Unlike Rokujouma, where you can pretty much tell near the halfway point of the series that they’re headed for some sort of polygamous ending, and everyone’s mostly confessed, here you’re continually reminded that the girls really are in constant rivalry with each other, and something else is probably needed to make sure we don’t end with an even bigger apocalypse. All right, let’s talk about the time travel. I mentioned in my review of the seventh volume that even though I suspected that Sophia was somehow going to be saved, that didn’t make the matter of Lyun’s grief and rage any less important to Rekka. We get to see that even more with the massacre of the psychic gang, which hammers home once more how difficult the “job” that Rekka has is, and how easy it can be to get an unhappy ending. Fortunately, this is not Grimgar or something similar, and I was happy to take the time-travel out, even if it did involve Rekka disturbingly having to leap off a building to trigger it. But even with the time travel there’s still a lot of tension here – I’d mentioned that there was little humor in this book, and it’s true. Little Apocalypse has gotten serious, and thankfully in a good way. Now, I’m not sure this will last. We’re exactly halfway though the series now, and I think the next volume may be far more comedic to make up for the serious bits here. But as long as it keeps up the small but noticeable character development we see here, and moves us closer to Rekka getting a clue and making a decision, then Little Apocalypse is still worth your time. 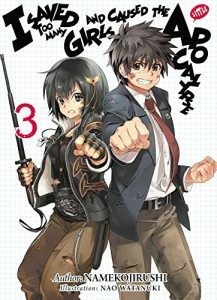 By Namekojirushi and Nao Watanuki. Released in Japan as “Ore ga Heroine o Tasukesugite Sekai ga Little Mokushiroku! ?” by Hobby Japan. Released in North America digitally by J-Novel Club. Translated by Adam Lensenmayer. 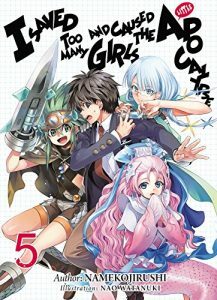 I was somewhat taken by surprise by the ending to this volume, as I kept reading and thinking “shouldn’t things be wrapping up soon?” It wasn’t until I got right near the end that I realized this would be Little Apocalypse’s first two-parter, something that should have been mnre obvious given this book features four heroines but only two of them are on the cover. It might be frustrating to wait till the 8th book too, as this volume actually ended up being one of the strongest in the series to date. The author has realized there’s only so far he can go with parody, and has moved on to deconstruction, which is a far richer vein. He’s also gotten better at juggling the heroines – sure, some are still missing or deliberately left out, but the balance we get here shows he’s thinking “who needs more attention?”, so Harissa gets a larger role here, as does Tsumiki. The series is beginning to mature… as much as a series like this can. As I said, we stack up four different heroines in this book, and they are of a wide variety: an idol singer who’s getting tired of the grind; a psychic (which is a much broader term in Japan than it is here) on the run from a yakuza-like psychic gang; a (seeming) former hero sealed in the depths of an alien dungeon; and a sylpheed (wind fairy) dealing with a zombie infestation. It’s a tall order even for someone like Rekka. Fortunately, his current harem is not at war with each other (that’s supposedly in the future), and he is thus able to use them as sort of a mobile army. 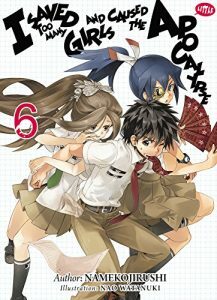 Thus, he and a team of girls go off to try to solve one issue, and Hibiki and another group try to work on the psychic problem. I really liked this, and enjoy that (for the most part) there’s not really much rivalry between the girls when serious events are happening. We also get lampshaded how weird everyone is when Rekka explains who he is to the idol and is surprised she DOESN’T know about magic. The other highlight of the book is a bit of a spoiler, but I want to discuss it anyway: what happens when Rekka fails? And how do we define failure? The sylpheed rejects Rekka because her sister (who we saw in the prologue) is already dead – she died before Rekka even arrived in her world. As R points out, that doesn’t mean that the story is over, and Rekka is working on another aspect of it by trying to fix the zombie thing. But Rekka fixing the stories usually ends with everyone happy (and happily in love with Rekka), and that doesn’t seem like it’s going to work out this time around. Now yes, I am very familiar with the genre, and would not be too surprised if a magical sister-saving solution popped up in Book 8. But it’s still a good question to ask: what if Rekka fails? Can he deal with the aftermath of NOT saving someone’s story? The book ends with everyone in trouble, and we’ve got to wait a bit till the next one. But Little Apocalypse in general has been qa quick, light, fluffy read. It’s nice to see it gain a bit of added depth. Despite the occasional attempt to tie things together between sections, this is what we always knew was coming in a series this large: a short story collection. The good thing about this is that everything takes place around Rekka’s school and neighborhood, so we get to relax a bit after the high stakes of the last volume. The bad thing, of course, is that low stakes events sometimes don’t equal high impact. The first story in this volume deals with Lea, the human-looking leviathan from Volume 2, and her attempts to actually hold down a job and earn money so she does not have to rely on “nice young men” buying her meals. Lea’s ‘clueless yet strong’ character is not really top tier among the heroines, and the addition of a terrible gay stereotype (which I was going to give a pass until he took the perverted customer into the back room for punishment – yes, the guy was a lech, but no. don’t do that) did not help matters. Thankfully, things pick up a bit after that. Only two heroines on the cover and added to the pile (that’s a total of 15 now, if you’re counting), but both of them are solid additions. Little Apocalypse sometimes tends to forget it’s meant to be a parody, but it’s a bit better on that front this time around – Rekka has never been more clueless about the fact that all these girls are in love with him. Given that, if you’re going to add memorable new heroines you need to make them ‘types’ so they stand out. Thus we have the teasing, large-breasted literature club girl, Midori, who is thought to be a ghost but in reality is simply quiet and weird – except around Rekka, whom she loves to hug from behind because, well, did I mention the large breasts? Despite the stereotype, she’s a lot of fun – it makes you realize we never really had a ‘tease’ among the heroines till now, and it gives a nice dynamic. The other heroine is Momone, who is not only Student Council President but also a Shrine Maiden and Demon Hunter. Honestly, you could fit three heroines in that description, but she does it all herself. Her blunt forcefulness is also something new added to the heroine lineup. Neither one of these girls needs saving by Rekka, as R notes – they aren’t “traditional” heroines the way the rest of the group has been, they’re more like Hibiki (who gets a short story at the end dealing with a vengeful ghost, which reads like an episode of Urusei Yatsura so much that I’m going to check my DVDs to see if they actually did that one). That said, it’s fairly clear by the end of the book that they both like Rekka just as much as the rest of them. The final story here is R reporting to her superiors on her progress, which is pretty much near zero. It does have R serving to remind us that this is technically HER story – the story of how she’s stopping the Apocalypse by going back in time and helping Rekka. Which so far seems to involve dragging him around then house as he sleeps so that she can watch TV late at night. So overall a decent addition to the series, and these books are always so short that they’re a light, snack-like read as you wait for the next Arifuerta or something similar to come down the pike. After a couple of books where I was fairly dissatisfied with the series, this is a much stronger volume of Little Apocalypse. It still has its cliches that it falls into, and has pretty much given up being a parody, but that also means the plot gets much more serious and thrilling. Rekka actually manages to achieve cool things, and his wishy-washyness about the heroines is a bit less frustrating. Also R has a lot more to do, and has become the reader stand-in, admiring the girls and tweaking Rekka. We also get a second book in a row where one of the heroines turns out to be not what they seem, but this one actually comes as a bit of a surprise, one of quite a few genuine surprises I had reading this book. There are still a few major problems with it (more on that below), but rating it against other books in the series, it’s the best since the first. The plot kicks off when Iris invites Rekka to a water planet for the weekend to do some swimming. By now Iris has gotten used to the fact that she can’t have Rekka all to herself as much as she wants, so she even goes as far as to invite the others as well. (The revolving heroine door revolves again this time – Lea can’t make it, but instead Tetra gets a much larger role, to make up for being absent in the prior book.) Upon arrival, they find the planet, in order to survive, has basically become a resort, with the mermaid palace a glorified hotel. Unfortunately, the palace is soon attacked by pirates, whose motive is murky but who seem prepared to kill. Rekka teams up with his usual crew, along with Rain, the princess of the mermaid planet; Shirley, a scientist who seemingly was simply there on holiday as well; and Fam, one of the pirates who’s noticed that the captain has not been himself lately. Interestingly, only the last two are identified as ‘heroines’ by R; I wasn’t sure why Rain wasn’t, but in the end she ends up being one anyway. As I said, for the most part I enjoyed this. The first at the end was quite good, and the villain’s broken motivation was treated with sensitivity by Rekka when almost any other hero would have simply taken them out. That said, I had two big problems. The first is Raul, a Lupin wannabe who seems to be there to do all the things that the author realized would be impossible for Rekka to achieve, which is nice except that seeing how Rekka achieves impossible things is the main reason to read the series. He’s a deus ex machina character. The other is the ending, which I knew was coming but still cringed at. If you’re going to have a villain threaten an entire planet with death and be well advanced in actually achieving this, even if the motivations do turn out to be “I have never had friends and am desperately lonely”, I’m pretty sure you still have to serve time. The Get Out Of Jail Free Because I’m A Heroine card works far less well here than it does for Rosalind. But oh well. Little Apocalypse is never going to be perfect, particularly as it keeps advancing its ridiculous premise. Most of the book works pretty well, some neglected heroines get things to do (and no doubt will be neglected again while others rotate in), Rekka gets to be cool and yet still unaware that people are attracted to him, and R is snarky. We’re almost a third of the way through the series, and I’m starting to be curious as to how the author can keep this up without it collapsing. Life as a parody can be difficult, especially when it’s unclear whether you are a parody or not anymore. Little Apocalypse started off being pretty blatantly a parody of all of those harems with piles and piles of women, as well as titles where the male lead goes around “rescuing” the girl of the week (hi, Index). But as the volumes have gone on I think it’s safe to admit that sometimes it tends to forget this and just tries to be a straight up harem action novel. You can usually tell by the fact that the author is forgetting to include R’s sarcastic asides for dozens of pages at a time, and it’s R that reminds us that Rekka’s frustrating indecision and waffley-ness is not actually bad writing but a deliberate decision. That said, I would not blame those who hate indecisive male leads from dropping the series, though I do wonder why they started it in the first place. 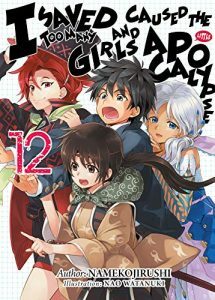 We’re back to three girls on the cover, and the author brags in the afterword about having made it to double digits on the heroines. That said, one of the previous ones doesn’t even get mentioned, and a second is only mentioned in passing. As with Negima, all heroines are important but some heroines are more important than others. New heroines this time include Rosalind, the blonde loli vampire that you knew we were going to get sooner or later, and who serves as the main antagonist (though she’s also a heroine); Silver Slayer, a homunculus trained to destroy Rosalind who has been chasing her the last two hundred years or so; and Chelsea, a mage who is desperately searching for a way to save her dying little brother. Add to all this Hibiki (from Book 3), who actually brings Chelsea to Rekka; Lea (from Book 2), who’s there to provide some muscle; and the main three heroines from Book 1, who likely always will be the top heroines. And then there’s Rekka, who continues to be the savvy-only-when-necessary male lead. As with most of these books, the first half drags quite a bit as we set up the pieces, and the second half is much better as the pieces all interlock and Rekka can deal with them all at the same time. When Rekka is fretting about having set up dates on Sunday with all the girls at the same time, the book sadly falls into the exact cliches it’s meant to be making fun of, and is not as interesting. (Also Christ, I hope he went to buy Harissa some clothes after this.) For a book that’s so low in page count, there’s a lot going on in each one – I didn’t mention the evil genie, or the Philosopher’s Stone. The author knows how to bring a situation to chaos and let it play out. He now needs to work harder on what to do when everything is at rest. Recommended for those who can tolerate a wishy-washy male lead, written by design. If you can’t, avoid this series with great avoid. 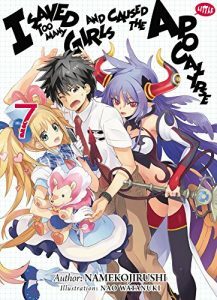 I had made much in my review of the first volume of this being a parody of the harem genre, and also talked about the humor in it. Book 3 is sadly lacking in good humor (R is barely in it), and the parody aspect is also starting to slip a little too, as we meet our hero’s female counterpart and find that she’s luring him to the dark side. Not that he’s turning evil or anything. But Hibiki also gets caught up in stories, as the heroine, and one of her friends – OK, if we’re being honest, her only friend – was injured because of that and is now in a coma. So ‘the dark side’ in this case means the darkness of the soul, where you wind up pushing everyone away because you don’t want to see them get hurt. And she infects Rekka with this mindset, which is a problem, because the entire premise of the series is therefore at risk. Fortunately, despite this volume being far more serious than the previous two, it holds up pretty well. The situations are still cliched, but having only one heroine to worry about much of the time streamlines things a bit, even as we still have to solve multiple promises. (Arguably the fox girl is a second heroine, despite Rekka’s cluelessness, but I’ll worry about that if she ever comes back). Rekka manages to overcomes his self-doubt, pushed along by a lack of confidence (something R lampshades, as she is wont to do). And the old heroines all get something to do. The scenes with Satsuki and Harissa are quite good, as thanks to Rekka pushing her away Satsuki has her own crisis of conscience. She’s known him the longest, after all. But Harissa is the ‘purest’ of the girls in terms of her love for Rekka, so she’s able to teach the valuable lesson this time, at least once she wakes up. The big drawback to this volume, unfortunately, are its heroines. Hibiki is meant to be a female mirror of Rekka, and also show what he could be if he went down the wrong path. As such, she’s a bit of a mess, starting off strong but eventually just hanging off the villain’s arm waiting to be rescued. Also, it feels weird to have one tsundere a mere volume after the classic example of Tsumiki. Hibiki’s crush on Rekka simply doesn’t feel earned, not the way the other girls’ do. As for the other ‘heroines’ here, the fox girl is cute but basically frets constantly the entire book, and Meifa is a living reward who doesn’t even get to speak at the end of the book. I realize that it’s hard to create strong characters every time, but given the premise the author has made for himself, it’s something he’s going to have to muscle up and do. So I’m a bit annoyed, but in the end turning more serious did not break the series, and there were several cool fight scenes. It looks as if Rekka has remembered the core to his series, which is ‘solve one girl’s problems using another girl’s talents’, and given Vol. 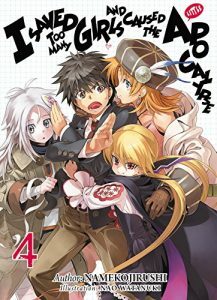 4 is back to three girls on the cover, he should be fine. This was a surprising license for J-Novel Club. Not because of the premise – honestly, the combination of harem parody along with the genre mashing of fantasy, SF, school life, and everything in between is highly appealing to North American markets. No, it’s just that this novel series is 16 volumes long in Japan, which is pretty lengthy, especially for a budding LN publisher. 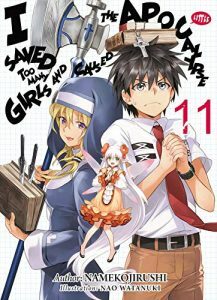 Thankfully, the 16th book seems to be the final one, so we don’t need to worry about it becoming a massive behemoth like A Certain Magical Index. And to be fair, judging by the lengths of these first two novels, 16 Little Apocalypses may be the equivalent of eight Devil Is a Part-Timers. The reason I bring all this up is because we not only get three heroines introduced here, but roles also for the first book’s heroines, and the introduction of (presumably) the next heroine at the end. By Book 16, what will the pileup look like? Well, probably like an apocalypse. Of course, not all heroines are created equal. Poor Harissa doesn’t really get to do much here except fret and use the occasional spell, and Iris is sent off until the thrilling finale requires her. Satsuki plays a larger role, but that’s more due to her magical wikipedia ability than anything else. This makes sense, given that we get three new girls here, and have fun seeing Rekka try to intertwine their stories in order to solve the problem. Fortunately, two of them are already intertwined: Tetra is essentially a shrine maiden devoted to doing something about the seal that is currently holding back a powerful monster, and Leviathan (aka Lea), the monster in question who turns out to have been imprisoned there falsely. The third heroine is more down to earth: Akane Tendo (cough) pardon me, Tsumiki Nozomuno, who family owns a failing restaurant and needs her to come up with a dramatic menu item to save the day, despite the fact that anything she cooks ends up as a poisonous black sludge, and also the fact that she’s a massive tsundere. 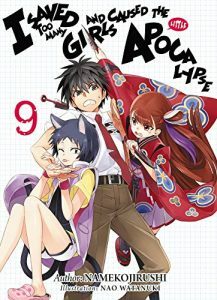 This volume is not quite as good as the first – I suspect the author forgets that he’s writing a parody of the harem genre at times, and when he does, things get rather tedious. The villain was quite good, but the introduction reminded me a lot of Kyubey – possibly deliberately, as I think Madoka Magica was airing when this was being written. 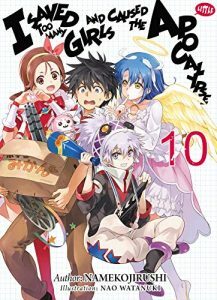 There are funny gags, although Rekka in a magical girl outfit is not as funny as the author – and indeed the rest of the cast – think. Worst of all, R’s snark is few and far between here, though when she does make a comment it’s as hilariously sarcastic and bitter as ever. She’s still easily the best part of the book. As I said, we get a cliffhanger ending to this book, which seems to introduce the subject of the third book. Will it limit itself to just one girl this time around? If we assume 3 girls per book, that would be 48 girls, which is edging close to Negima territory, so I’m hoping that we back off a bit. I’m also hoping for a bit more making fun of the harem comedy and less conforming to it. Still, this is easy reading and fun enough for those who enjoy the genre.